Voodoo Tactical Tobago Pack FREE SHIPPING! 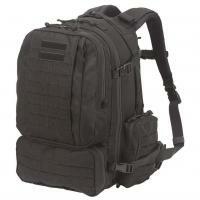 Carry more gear with greater comfort using the versatile Tobago Pack from Voodoo Tactical. Designed to offer maximum storage capabilities, the bag features a myriad of pockets and external attachment options. A large primary pocket provides a spacious storage area with internal dividers for organization and easy access to smaller items or accessories. Four external pockets utilize reverse zippers to offer additional storage and item segregation. Extensive, external MOLLE-webbing and bedroll loops provide secure attachment points for additional gear, creating a truly versatile pack. Designed for all day use, the Tobago employs an integrated hydration system able to hold up to two, three-liter bladders. An aluminum and polymer internal frame provides a sturdy back that works in conjunction with the padded backpack harness and sternum strap to offer comfortable wear that will last for miles and miles. Carry on the back, or remove the backpack style harness for a convenient carry bag. ©2002-2019 CopsPlus.com: Voodoo Tactical Tobago Pack FREE SHIPPING!